At Direct Teamwear our aim is simple. To provide a range of high quality kits and training wear at low prices. Buying direct from the manufacturer means you can make great savings on all your teamwear needs. 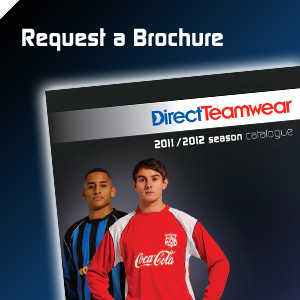 And with Direct Teamwear there's great value without any compromise on quality. Our 200,000 sq.ft hi-tec manufacturing facility has built-in export and quality control units which mean our products are consistently produced to the highest standards. Our kits consist of 15 shirts, 15 shorts, 15 pairs of socks and a full Goalkeepers kit. This means you can kit out a full squad of 16 players from as little as £175 for a junior team or £199 for adults. Alternatively, we can offer sets of 9 shirts, 9 shorts, 9 pairs of socks and a full goalkeepers' kit to cater for 7 a side or Mini Soccer. Or for extra flexibility you can even order single sets of shirts, shorts and socks.